Designed with a smaller group in mind, this take on a holiday meal includes power foods such as berries, nuts and chocolate. We’re bringing chicken back too- few know it blessed the first Thanksgiving in 1621. Seek an organic or free-range bird for the best flavor. Try North Valley or K & M Farms, both located in Abbotsford. Cranberry sauce gets an antioxidant flavor boost with the addition of blueberries and ginger, and then we bake the blend into chutney. Truly an impeccable compliment to our holiday roast chicken. The best part? You can make it up to a week in advance, storing it in the refrigerator until needed. Preheat oven to 176 Celsius / 350 degrees Fahrenheit. Put all berries in a 9-inch or similar sized baking dish or casserole. Add the sugar, vinegar, cloves and cinnamon. Stir to combine. Bake mixture uncovered for 30 minutes. Remove from oven and stir, then resume baking for another 20 to 30 minutes. The chutney is done when the berries become tender and their juice becomes syrupy. Add additional water to thin slightly if desired. Remove the cloves and cinnamon stick, cool and store until needed in the refrigerator. Optional: Add chopped pecans, walnuts or your favorite nut if desired. For fall flair, add chopped roasted chestnuts available in many Vancouver markets. An old world classic spaetzle, meaning “little sparrow” is a nice alternative to mashed potatoes and gravy. These crunchy noodles with a buttery herb sauce have an incendiary taste that will bring you back for seconds. Put the milk and eggs in a large bowl and whisk to combine. Add the flour, salt, pepper, nutmeg and half of all herbs. Whisk until batter is smooth. Fill a stockpot two thirds full of water and lightly salt. Bring to a soft boil only. Set a large bowl of ice water next to the stove. Using a food mill with the coarse grating disk, spaetzle maker or ricer, push the batter through the mill one cup at a time directly into the softly boiling water. Cook spaetzle noodles for one minute then transfer to the ice water. Repeat with remaining batter. Drain noodles in a colander. Noodles can be made and refrigerated several hours before needed. To crisp noodles, melt the butter in a large frying pan over medium-high heat. When it barely begins to brown, add noodles and toss in the butter to coat. Cook, stirring periodically until the noodles become golden brown and crispy, 6 to 10 minutes. Add the remaining herbs, then season with salt and pepper to taste. Transfer to a warm bowl and serve immediately. 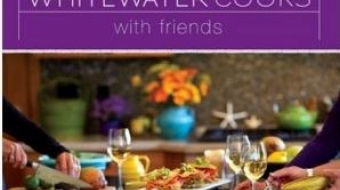 Whitewater Cooks with Friends is about sharing good food and recipes with those you love. This interview with Shelley Adams also includes a delicious and healthy salad recipe from her cook book. 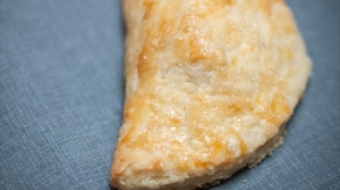 Apple season is here and these flaky apple turnovers are perfect for a blustery day.